Seriously rich and delicious brownies with way more goodness than the normal ones! 400g Raw Beetroot peeled and roughly chopped (use plastic gloves if you don’t want to stain your fingers) then add to saucepan and boil/steam till tender. Heat oven to 180C and grease a tray bake pan. 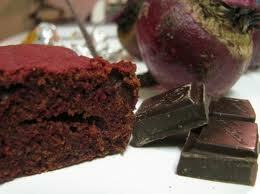 Roughly chop chocolate, and put in food processor with cooked beetroot, coconut oil and vanilla. Whizz until mixture is smooth. In another bowl, beat sugar, eggs and salt until foamy and thick. Fold in beetroot mixture. Sift in flour and cocoa and gently fold. Stir through hazelnuts. Poor into tray bake and cook for 20mins. Cool completely in tin then cut into squares. This can easily be a cake, just don’t cut into squares! Place all ingredients in a high-speed blender. If possible, let them sit in there for a few minutes to soften the dates a little bit. Blend all ingredients in your high-speed blender. The ingredients can be a little finicky to blend, so start at a slow speed and increase speed slowly. Keep blending for a very long time to get a velvety consistency. This is one of those recipes that really makes use of the power of a high-speed blender. If you feel that the blades are just spinning but aren’t actually moving all of the icing around, turn the blender off and make an air pocket down the side of the blender with a spatula to expose the blades. Remove the spatula, replace the lid, and start blending slowly again.You’ll know it’s ready if there are no bits of dates and all you can taste is velvety chocolate goodness. 1/4tsp saltPreheat oven to 175C. Grease pan. In a medium bowl mix bean mixture, sugar, vanilla, mashed banana and chia seeds. In another bowl combine dry ingredients. Gradually stir dry ingredients into wet, until well blended. Bake for 20-25mins or until brownie starts to pull away from edges of pan. Let cool then cut into squares. Enjoy and let me know how they go- if you have any others to add!